Wayne Thiebaud is an American painter whose most famous works are of cakes, pastries, boots, toilets, toys and lipsticks. He is associated with the Pop art movement because of his interest in objects of mass culture, although his works, executed during the fifties and sixties, slightly predate the works of the classic pop artists. Thiebaud uses heavy pigment and exaggerated colors to depict his subjects, and the well-defined shadows characteristic of advertisements are almost always included in his work. Thiebaud was born to Mormon parents in Mesa, Arizona, U.S.A.. His family moved to Long Beach, California when he was six months old. One summer during his high school years he apprenticed at the Walt Disney Pictures Walt Disney Studio making 'in-betweeners' of Goofy, Pinocchio, and Jiminy Cricket making $14 a week. The next summer he studied at the Frank Wiggins Trade School in Los Angeles. From 1938 to 1949, he worked as a cartoonist and designer in California and New York. He served as an artist in the First Motion Picture Unit of the United States Army Air Force from 1942-45. In 1949, he enrolled at San Jose State College (now San Jose State University) before transferring to Sacramento State College (now California State University, Sacramento), where he earned a bachelor's degree in 1951 and a master's degree in 1952. He subsequently began teaching at Sacramento City College. In 1960, he became assistant professor at the University of California, Davis, where he remained through the 1970s and influenced numerous art students. On a leave of absence, he spent time in New York City where he became friends with Willem De Kooning and Franz Kline and was much influenced by these abstractionists as well as proto pop artists Robert Rauschenberg and Jasper Johns. During this time, he began a series of very small paintings based on images of food displayed in windows, and he focused on their basic shapes. 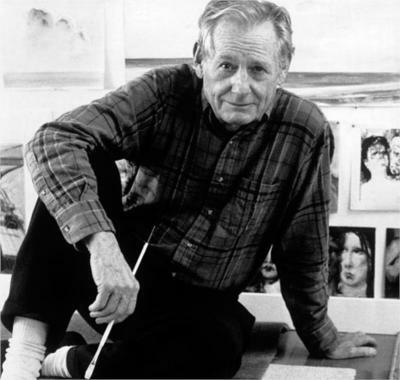 In 1960 he had his first one-man show in San Francisco at the San Francisco Museum of Modern Art and in New York City at the Staempfli and Tanager galleries. These shows received little notice, but two years later, a 1962 Sidney Janis Gallery exhibition in New York officially launched Pop Art, bringing him national recognition although he disclaimed being anything other than a painter of illusionistic form. In 1962 Thiebaud's work was included, along with Roy Lichtenstein, Andy Warhol, Jim Dine, Phillip Hefferton, Joe Goode, Edward Ruscha, and Robert Dowd, in the historically important and ground-breaking "New Painting of Common Objects," curated by Walter Hopps at the Pasadena Art Museum. This exhibition is historically considered one of the first Pop Art exhibitions in America. These painters were part of a new movement, in a time of social unrest, which shocked America and the art world and changed art forever. On October 14, 1994, he was presented with the National Medal of Arts by President Clinton. Wayne Thiebaud has been married twice. With his first wife, Patricia Patterson, he produced two children, one of whom is the model and writer Twinka Thiebaud. With his second wife, Betty Jean Carr, he had a son, Paul LeBaron, who later became an art dealer. He also adopted Betty's son, Matthew. Wayne Thiebaud /weɪn tiboʊ/ WAYN TEE-boh (born November 15, 1920) is an American painter widely known for his colorful works depicting commonplace objects—pies, lipsticks, paint cans, ice cream cones, pastries, and hot dogs—as well as for his landscapes and figure paintings. Thiebaud is associated with the pop art movement because of his interest in objects of mass culture, although his early works, executed during the fifties and sixties, slightly predate the works of the classic pop artists. Thiebaud uses heavy pigment and exaggerated colors to depict his subjects, and the well-defined shadows characteristic of advertisements are almost always included in his work. Thiebaud was born to Mormon parents in Mesa, Arizona, United States. His family moved to Long Beach, California when he was six months old. One summer during his high school years he apprenticed at Walt Disney Studios drawing "in-betweens" of Goofy, Pinocchio, and Jiminy Cricket at a rate of $14 a week. The next summer he studied at the Frank Wiggins Trade School in Los Angeles. From 1938 to 1949, he worked as a cartoonist and designer in California and New York. He served as an artist in the First Motion Picture Unit of the United States Army Air Forces from 1942 to 1945. In 1949, he enrolled at San Jose State College (now San Jose State University) before transferring to Sacramento State College (now California State University, Sacramento), where he earned a bachelor's degree in 1951 and a master's degree in 1952. Thiebaud subsequently began teaching at Sacramento City College. In 1960, he became assistant professor at the University of California, Davis, where he remained through 1991 and influenced numerous art students. He continues to hold a Professor Emeritus title there. Thiebaud did not have much of a following among Conceptual artists because of his adherence to basically traditional disciplines, emphasis on hard work as a supplement to creativity, and love of realism. Occasionally, he gave pro bono lectures at U.C. Davis. On a leave of absence during 1956–57, he spent time in New York City, where he became friends with Elaine and Willem de Kooning and Franz Kline, and was much influenced by these abstractionists as well as by proto-pop artists Robert Rauschenberg and Jasper Johns. During this time, he began a series of very small paintings based on images of food displayed in windows, and he focused on their basic shapes. In 1960, he had his first solo show in San Francisco at the San Francisco Museum of Modern Art, and shows in New York City at the Staempfli and Tanager galleries. These shows received little notice, but two years later, a 1962 Sidney Janis Gallery exhibition in New York officially launched Pop Art, bringing Thiebaud national recognition, although he disclaimed being anything other than a painter of illusionistic form. Artworks of Wayne Thiebaud are removed from WikiArt due to a copyright infringement notice.